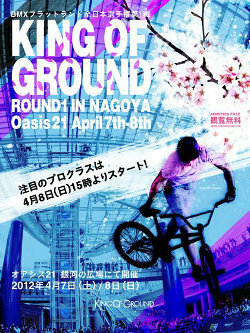 Today, the day 2 of King Of Ground round 1 took place in Nagoya, Japan. BMX contest season is starting now in Japan!! The Girls&Kids class and first expert qualification took place yesterday, the novice, second expert qualification and finals, and pro qualification and final took place today. The result were posted on Shinde's blog.